photo retouching (Homepage) wrote: I wish I was there. Beautiful! Tero (Homepage) wrote: Strong, bold colors! Toni (Homepage) wrote: What a beautiful beach! And a clever use of a tree. Beautiful capture of both. Thank you for your visit and comment. Beat (Homepage) wrote: wow stunning wallhanger. such beautifull strong colors! Arjan - PlasticDaisy (Homepage) wrote: That one strong popping colour makes this shot so much more interesting! The beach, water and sky are calm and smooth, and then the towel breaks the calm! Terry H. (Homepage) wrote: Hand me a orange towel would ya. Man I would like to be there right about now. Beautiful shot! NJ & SB Photography (Homepage) wrote: a alguien se le mojó la ropa y el árbol le ha venido muy bien!! bien vista!! Giovanni (Homepage) wrote: Fantastico! L'asciugamano arancione è un tocco di genio! Hoai Bao Photography (Homepage) wrote: What a beautiful shot. Simple yet so elegant. Andrées (Homepage) wrote: No need for clothes pins or clothes for that matter. A beautiful site and a nice image of it. John Maslowski (Homepage) wrote: A beautiful picture of this serene ocean and beach scene. Lovely colors and tones. Superb clarity and the tree adds to this wonderful setting. Excellent composition. Marcie (Homepage) wrote: Love the subtle colors in the landscape..and then - the sudden sruprise of contrasting orange. Great eye!!! Denis (Homepage) wrote: IN such a landscape, I would leave the towel and never come back ! CushmoK (Homepage) wrote: piece of paradise ? martie (Homepage) wrote: Looks like a deserted island! Beautiful shot - love those white sand beaches. Michael Rawluk (Homepage) wrote: The orange colour sure pops out of there. That is a gorgeous shot. beanow (Homepage) wrote: Amazing frame! I am under the great impression... Masterly picture! Susan (Homepage) wrote: Great composition and tones-the orange shirt really adds a punch to the shot! Guido (Homepage) wrote: The colors are incredible! I miei complimenti per essere riuscito ad arrivare in un luogo simile. 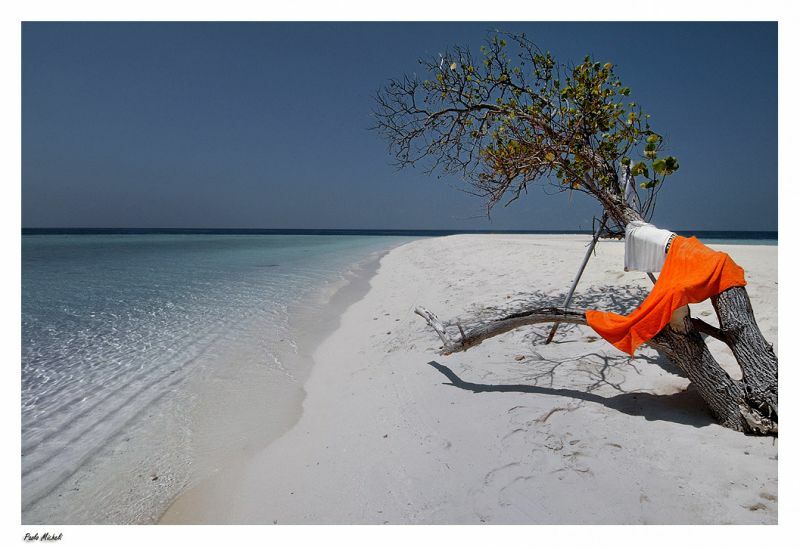 Pedro (Homepage) wrote: Excellent idea, Paolo, the orange towel adds power to the image and helps the composition. A real paradise indeed. Frida (Homepage) wrote: I totally agree with all that is said. Excellent capture!! Arnd (Homepage) wrote: This photograph has a very fascinating, dreamy quality. I love the vast emptiness and the palpable solitude. Robert Kruh (Homepage) wrote: Very creative shot, beautiful view and very rich photograph with clothes on tree :) Great work! Andy (Homepage) wrote: Wow looks like the last tree on earth! Love the color of the clothes on the tree. grant (Homepage) wrote: the simple life! i'm jealous... beautiful shot. Mike (Homepage) wrote: Another excellent shot! Along with the beauty, I love the punch of color and interest the clothes bring. Nice! Bram Antareja (Homepage) wrote: beautiful foto composition. i love this atmosphere. regards fro yogyakarta city, yogyakarta. Omar (Homepage) wrote: Looks like you've been stranded, hopefully you had some drinking water? Very cool picture! TP@Photoskiasi.com (Homepage) wrote: Amazing, beautiful, color detail. This orange detail adds so much power to your photo. Excellent!!! Krims@nline.be (Homepage) wrote: Wow, endless view, deep blue sky, white sandy beaches and contrasting orange ... excellent work Paolo!